MPLAB® Harmony is a flexible, abstracted, fully integrated firmware development platform for all PIC32 microcontrollers with the exception of the PIC32MM family. It takes key elements of modular and object oriented design, adds in the flexibility to use a Real-Time Operating System (RTOS) or work without one, and provides a framework of software modules that are easy to use, configurable for your specific needs, and that work together in complete harmony. MPLAB® Harmony includes a set of peripheral libraries, drivers and system services that are readily accessible for application development. The code development format allows for maximum re-use and reduces time to market. The MPLAB® Harmony Configurator (MHC) makes it easier to use the Harmony framework. This intuitive user interface takes care of the overhead and over-all structure of Harmony based projects, allowing you to focus on generating the code for your application. 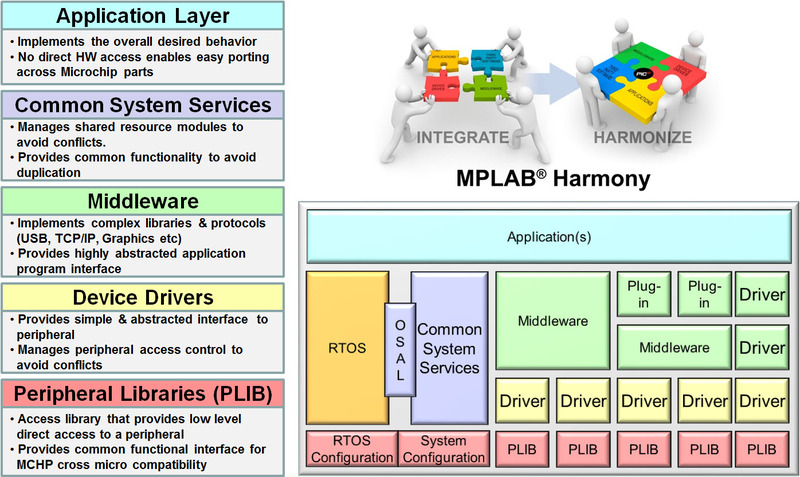 The following video provides a high-level overview of the MPLAB® Harmony Software Framework. The purpose of each module, and how it relates to other modules, is briefly described.